Nancy Twine grew up in a family of women–from her grandmother down– who were always brewing up homemade personal care products. This experience stuck with her and she formulated it into a brand new business. Twine is founder and president of fast-growing natural hair care brand Briogeo (pronounced: bree-oh-jhee-oh). Twine so believed in creating a company for women who what to go the natural hair route, that she left a successful career in finance. And since leaving her coveted Wall Street job, she hasn’t looked back. Since its launch a year ago, Briogeo is taking on the big layers in the hair care industry. Twine has already inked a partnership with Sephora stores. With this move, Twine, 29, became the youngest African-American woman to ever launch a line at the major retailer. Briogeo natural hair products can also be found at Urban Outfitters as well as Fred Segal. Twine tells TNJ.com her plans for Briogeo. TNJ.com: What made you enter the haircare industry? Nancy Twine: Briogeo was inspired by my own family history of making homemade personal care products at home decades ago–way before the natural personal care market is where it is today. ?It first started when my grandmother was swayed to create her own products out of necessity to provide for the large family she raised on her farm. ?From there, my mother learned the craft and growing up we would make a wide assortment of homemade products ranging from soaps to hair care products. ?My family history of making natural products at home, the recent rise in consumer demand for natural beauty products, and my passion for entrepreneurism are what motivated my desire to create Briogeo. TNJ.com: What gave you the courage to leave a great job in the corporate world and venture out on your own? NT: I had been working within the Commodities Sales & Trading group at Goldman Sachs for seven years and I felt like it was time for a change. 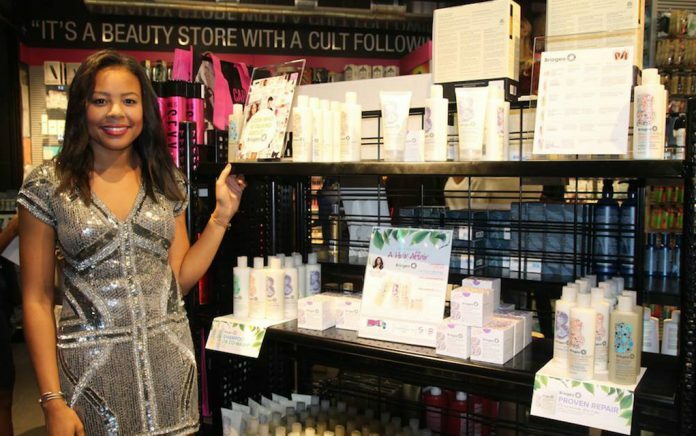 ?I’ve always had an entrepreneurial spirit and when I began putting the wheels in motion for my hair care venture, I realized what I was really most passionate about. ?That passion and determination to create my own product line is what fueled my confidence in making the decision to leave the corporate world to pursue my own venture. ?I haven’t looked back since. TNJ.com: ?What were some startup challenges? NT: There are a lot of moving parts to manage when starting a business. ?I do not have a co-founder, so I was solely responsible to ensure that everything was moving in the right direction while managing several timelines at once. ?As an entrepreneur, you wear many hats ? and the responsibilities are that much greater when you are a sole founder of a startup. NT: I funded my venture with a mix of my own personal savings and added financial support from a few angel investors. TNJ.com: How did your corporate experience help you in the venture? NT: My corporate experience taught me a long about team work, meeting deadlines, thinking strategically, and seeing a project through from start to finish. ?I would say that the vast majority of skills I learned in the corporate world are applicable to what I do every day as an entrepreneur. Had I not had the training and skill building developed through my work in the corporate environment, I think it would have a lot harder to get my business off the ground the right way. TNJ.com: What are some of your current challenges? NT: As an entrepreneur, you don’t have the same internal resources ?to help you balance the day-to-day and intricacies of running the business as you would working in a corporate setting. As a founder, you wear many hats to pick up the slack and keep the company moving forward, which can be very challenging. ?There is a lot of production — from design to manufacturing – involved in creating consumer products and it requires coordinating with several different remote teams and adhering to very strict deadlines. ?Because all of the moving parts are outsourced in various parts of the US, I often times serve as the sole connector to everyone involved in the process which can prove to be challenging at times. TNJ.com: Your timing seemed perfect, as the natural hair trend is booming. Had you expected this? NT: When I graduated college and moved to NYC, I noticed a seemingly growing trend within the beauty space ? more and more natural beauty brands were popping up. ?In line with heightened consumer demand for natural and organic foods, it made sense to me that the trend was filtering over into the personal care space. ?Healthy living really is a lifestyle and I don’t see the trend of moving towards natural beauty products being a short lived one ? I really think it’s here to stay. TNJ.com: What do you enjoy the most about what your do? NT: I love the fact that every day is a new challenge and that I get to participate in every aspect of the business ? whether it be new product development, marketing, sales, operations, or branding. ?This has allowed me to learn so much about the entire process of building a brand from start to finish. ?I’m really grateful for the opportunity to be able to incorporate both creative and quantitative skills into what I do on a daily basis.